Found it what is it ? This could be interesting. It looks old (duh). 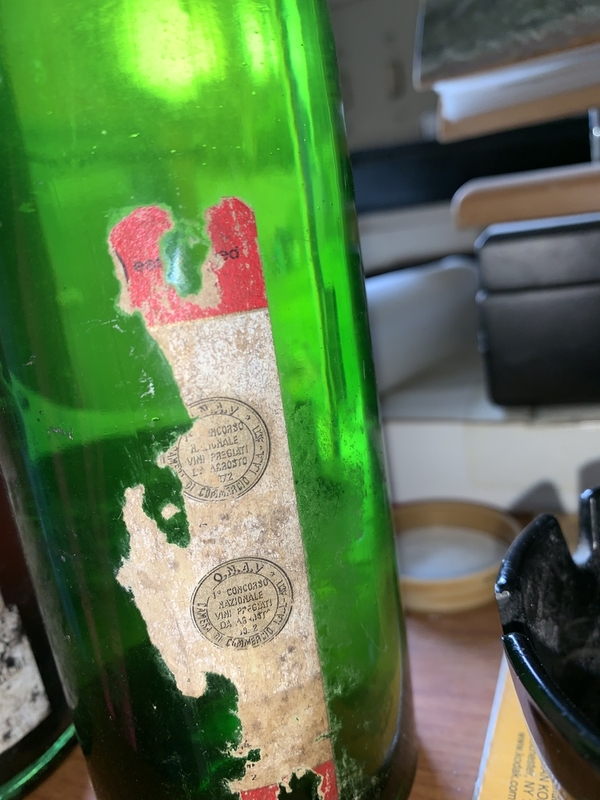 Is the vintage legible anywhere on the label? Or maybe on the cork, if you can read it through the glass? Where and how has it been stored over the years? 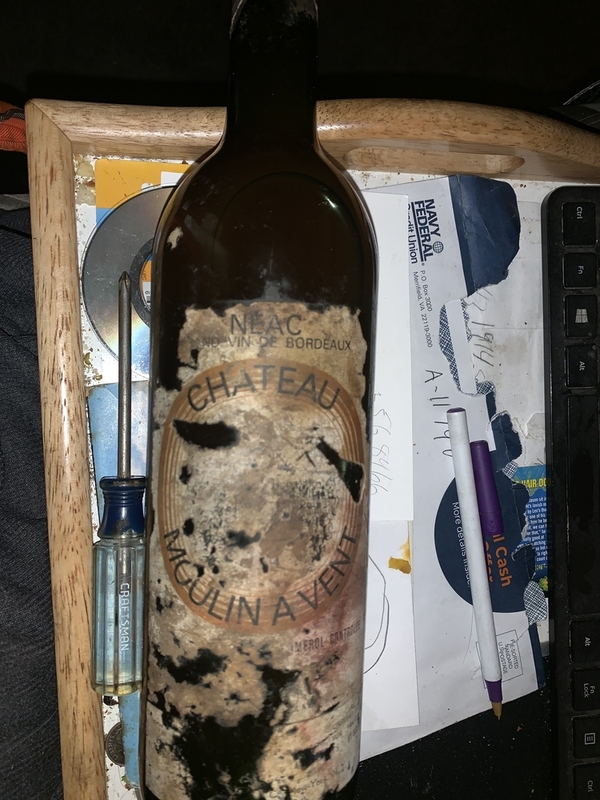 If it has been stored properly (on its side in a cool dark place, 55 F or so, free from vibration or frequent disturbance), then it might be drinkable. How high is the fill level? 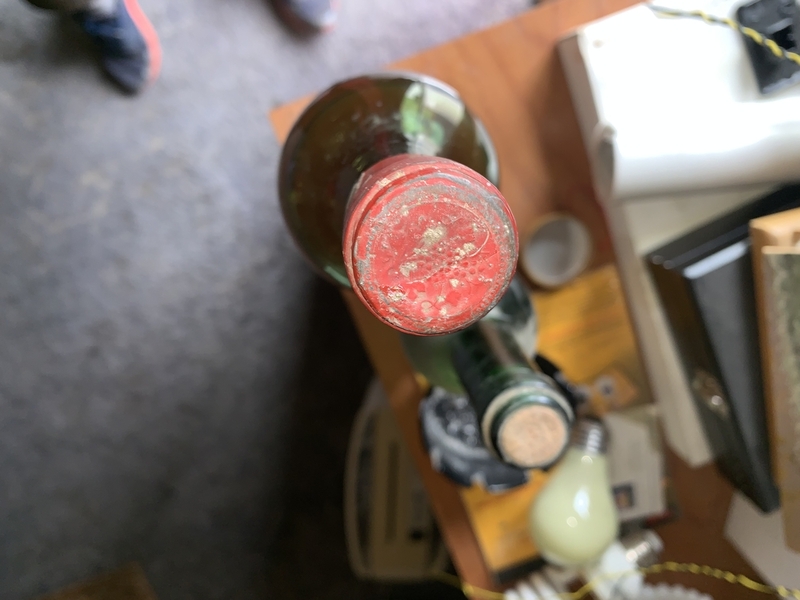 Please take more photos with the bottle standing upright, showing the level of the wine in the bottle, and also a close-up of the top of the bottle showing the cork and foil capsule. It appears to be a Pomerol, so it's mostly or entirely merlot. A quick search on Cellartracker suggests the producer was still in business as of 2007. Do you open wine with a screw driver? Where did you find this relic? very tough to decipher. Agree with Javachip. Obviously stored in an underground dirty environment, which is ok if the temperature is reasonable and constant. Isn't this the Moulin-a-Vent that can be had for about $25 for the recent vintages? 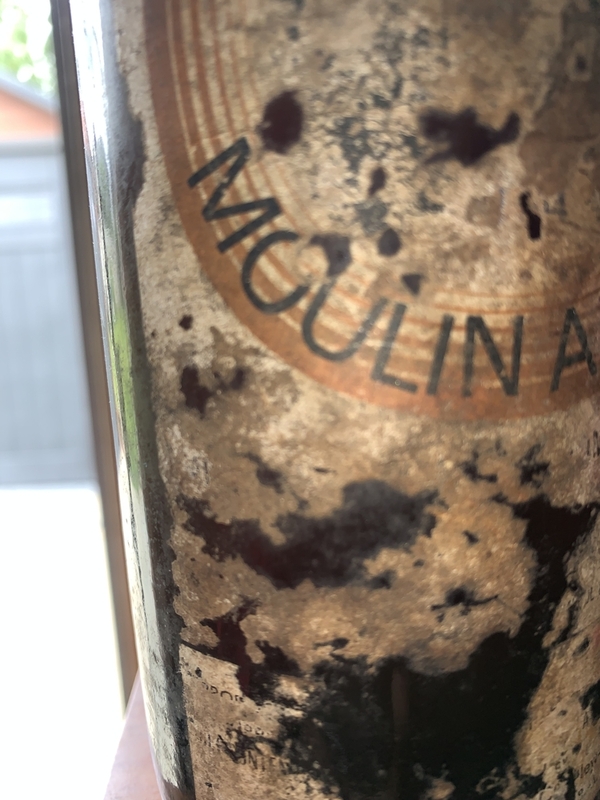 Chateau Moulin-a-Vent out of Pomerol. Low level Bordeaux on a good day. 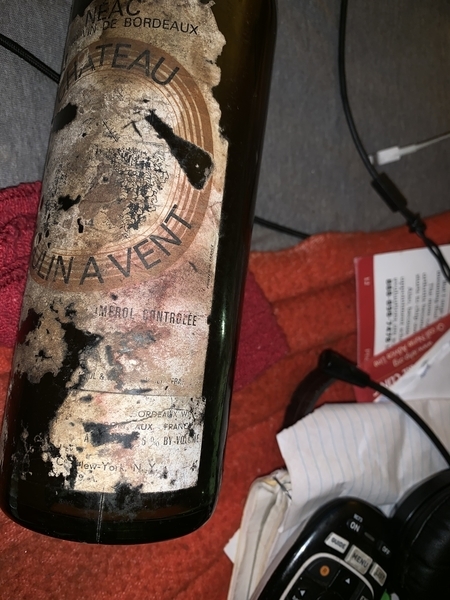 A bottle of the 1964 vintage (almost exact same label except this one is in pristine condition) is currently on Winebid. Basically little to no value if impeccably stored. Not even worth cooking with. The vintage ends in "4". Your eyes are a heck of a lot better than mine. OK. It also apparently comes with a Craftsman screw driver, a dirty circa 1990s keyboard and a grimy DirecTV remote. Maybe you can $20 for the lot. Assuming the photo on the left is your Moulin a vent, it is worthless. From the color it is totally oxidized. Pour the contents out in the sink. 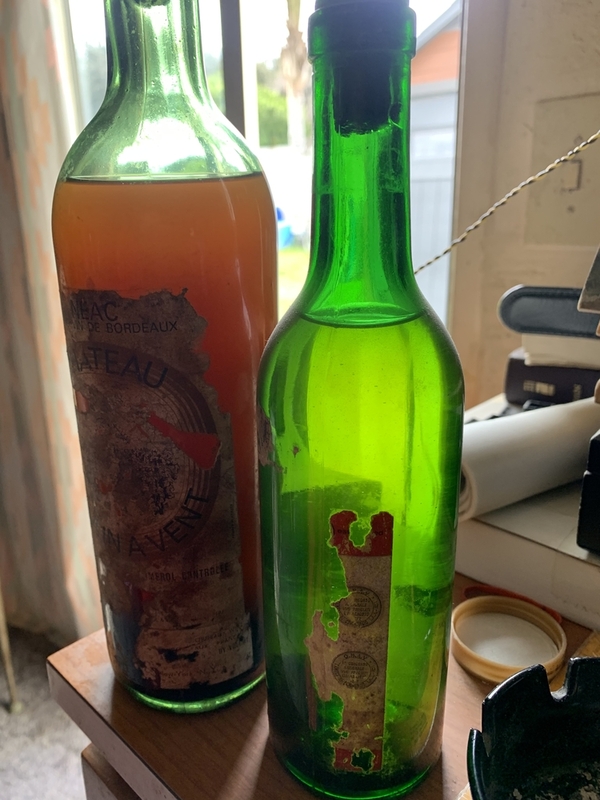 Hello ser I found the bottles at my grandfathers he has passed can you tell me did he bring them back from ww2 do you think ? Of all the things he may have brought home from WWII (guns, cognac, venereal disease), I'm not sure why he chose that crummy wine. But now you have me curious- You are missing your left....... what? Hello lol did you see the other bottle. I was saying I am missing my left arm and left leg below the knee I zig should of zag. So am I wasting my time bro ? I'd say we're done here. 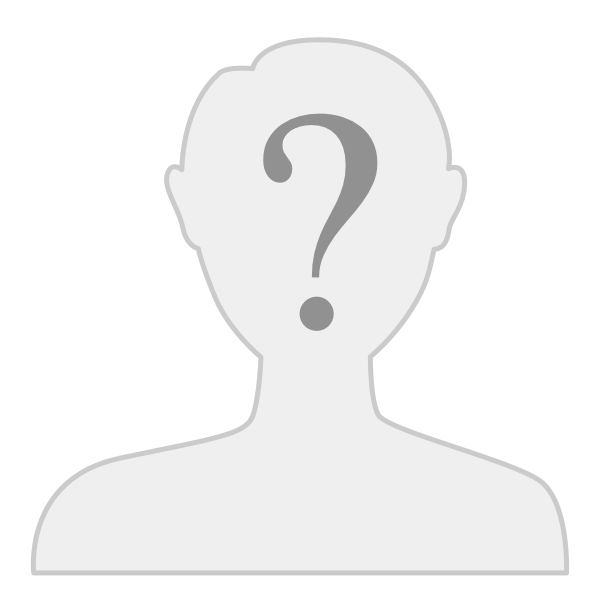 Was it found in Rudy Kurniawan's basement?